In keeping with our Association's Charter, this web site has been designed for the purpose of honoring and preserving the memory of Roger Williams and promoting communication among his descendants. We hope you enjoy your visit to this site and we welcome your comments and suggestions. Please be advised that although our association will make every effort to answer your genealogical queries, at this time we are not set up to handle genealogical queries via e-mail. Should you not find what you need in your local library, the Resources page herein, or the "Sources and Suggested Reading" section of the Biography herein, please correspond by mail with our Registrar. At right is a painting by artist Jean Blackburn depicting the town of Providence about 1650. If you were on what is now College Hill and looked west, this is what you would have seen. The Great Salt Cove fills the center of the picture. Over on the far right, the large flat area is where the State House now stands. The road that runs across the middle ground is Towne Street which became North Main Street. 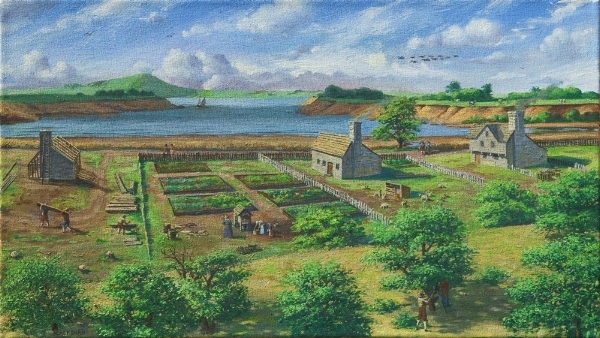 At center is Roger Williams' house and house lot. Just across the street is the fresh water spring. Large hill in the upper left is Neutaconkanut Hill. Oysters, clams, quahogs and lobsters were found here in abundance. Salmon would run up both the Moshasuck and Woonasquatucket Rivers . Ducks and geese by the thousands stopped here on their way south in the fall and also on their way north in the spring. As Roger said, this truly was "God's Providence" to him in his distress. © Copyright 1997-2019 Roger Williams Family Association. All rights reserved.